017 – When Harry Met Sally | All Eighties Movies. All The Time! This week we look at one of the biggest Rom-Coms of all time, When Harry Met Sally. Starring Billy Crystal, Meg Ryan and the wonderful Carrie Fisher. 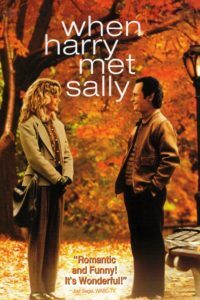 This entry was posted in Podcasts and tagged comedy, harry and sally, romance, romcom. Bookmark the permalink. Fantastic pod cast. Love it. Wish you played more music but you summed up the movie so beautifully. Wonderful job Gidgit & Angry- what a great way to start 2017 with a fun podcast! Gidgit continues to crack me up. I’m very excited to hear what films you will be covering in coming weeks- especially Raiders Of The Lost Ark. Thanks! Good pod cast. I’ve always thought I was Sally. Difficult! No wonder I’m still single. Loved your pod cast and so much fun. Gidget is very funny. I love the Harry Connick Jnr music as well. I have to listen to more of your podcasts. I’m turning 45 this year. I grew up with these movies. You two are so funny. I adore this film. I watch it every year. It is my ‘go to’ romantic comedy. My daughter watched it with me then listened to your podcast. She is 11 and I’m grateful no swearing. She loved it as did I. I’m not one to comment but hope you do more romantic comedies? This movie is my favorite romantic movie. Thank you for this really funny pod cast. Such respect for this film. Billy and Meg were perfect together and I love that I might have that. Catching up on your podcasts and loving them sooo much. I’m becoming a bit of an addict to be honest. thanks Rebecca – we’re happy youre enjoying listening so much!